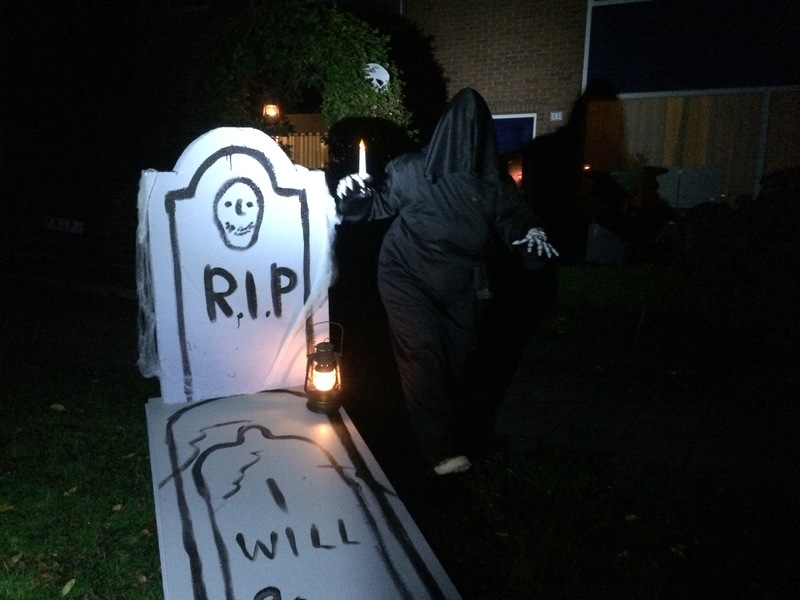 The bi-annual Eerbeek Halloween fun rides are infamous, and for some reason I’ve never gotten around to riding it. This year I invited my 11 year old nephew, we had some laughs (and screams) this ride. The first thing we noticed where the signs on the way over, huge lights screaming “event”. I got to think it was’t just a small local ride with a Halloween theme… Not so much, in fact about 3.000 bikers for all over the country showed up for this unique ride. Most of them properly dressed for the occasion. We on the other hand where shamefully underdressed. A mistake we will not make again. The first km or so was a long parade of cyclists until we came to a junction: 2 mtb rides and 2 regular bicycle’s rides. Every route had countless features along the way. Shops, gardens, garages, farmhouses, factories and camp-sites where converted to haunted places and we got to go to every one of them. Because we had no real idea of this event, we where so surprised and delighted at any haunted place. People went to great measures to entertain, surprise or scare us, it was so great. The first lap we took was very popular and we had to wait in line some times. We didn’t get to start lap 2 until pretty late. But every haunted place was open, with scary folk that kept on going until the very last rider. In the second lap there was also a bit of night-riding in the woods, that was also very nice. One time, I was in front luckily, we where riding just the two of us. Big dark and silent woods around is, with my humongous lights there was actually nothing to be afraid of and it was sort of peaceful. That was until a girl jumped from behind a tree screaming in my ears until I was deaf… it scared the living sht out of us both, but we laughed out heads of about it too. It was so unexpected… and it happend again 5 minutes later… in my other ear! There was too much going on to mention, from chainsaws to werewolves and dragons. I can only say this is one event you just have to experience yourself. 2016 is already in the books, oktober 29th, we’re there with our best Halloween costumes this time! Big thanks to mtb club ‘Next Gear’ in Eerbeek and all volunteers for a wonderful ride. I think Last Gear rides are among the best in the Netherlands, always entertaining, challenging and fun. Big compliments to you all.